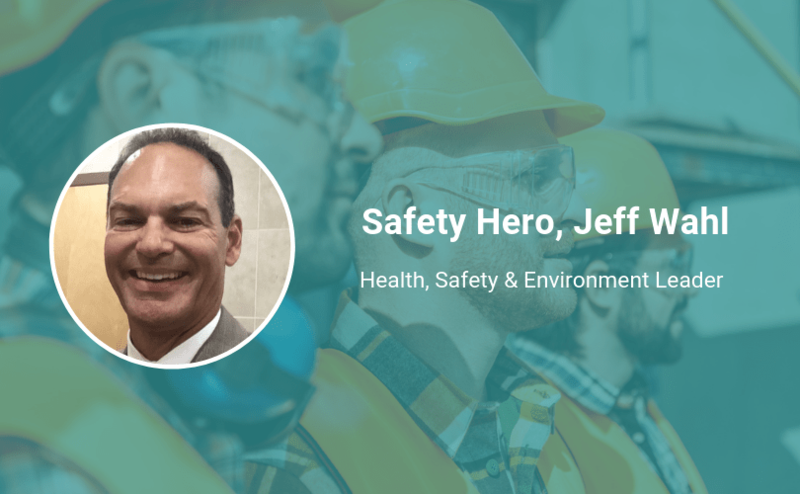 As a senior health and safety professional, Jeff Wahl has wealth of experience in developing, implementing, and managing health and safety programs and processes in construction, tunneling, mining, maintenance, petrochemical, roadway industries, and beyond. He also regularly works alongside senior management, legal managers, risk managers, claims managers, and insurance adjusters to properly identify risks and to take proper and appropriate action if an incident occurs. Keep reading to see why this Safety Hero says he would change about how safety is managed—and why safety leaders need to always live out their safety values. I fell into safety, no pun intended. Safety was relatively new when I joined the workforce. Safety was beginning to be addressed because of the drastic increases in workers’ compensation, general liability, and auto insurance premiums. There was no degrees in safety at the time, so companies were training employees that had an appropriate background and commitment to safety. “Push until they push back.” Meaning, keep being pro-active in improving the safety process/program until management pushes back, hard. Then fall back and regroup. “Pick your safety battles.” As a safety professional, you know safety will ultimately win the argument, subject, debate, etc. But as a safety professional, one needs to be patient when it comes to operations acknowledging, accepting, and implementing changes in safety policy and procedures that will impact how the business performs tasks or work. Of course, there are times when procedures must be changed immediately if an imminent danger situation is identified or generated as a result of the current procedure/process. “If you can’t manage safety, you can’t manage.” A good barometer in how a business, project, department, task, or activity (i.e. operation) is progressing overall is how safety is being managed/addressed with that operation. If the implementation of the safety program is considered “poor,” there is a very good chance that the overall management of the operation is also poor. Communication. Verbal – This includes: one on one, in front of a group of employees, in front of a group of managers, and on a conference call. Written – Be able to document your thoughts short and concise on paper, and being able to write a procedure that can be understood. Safety policies/procedures associated with the business and operations. Regulatory agencies that coincide with the business operations. Look/act the role. Safety professionals need to live, eat, act, and respond as one would expect a safety professional to do, even when not working, [such as on] weekends, vacation, and when no one is looking. I like to consider myself as “D’Artagnan”. Somewhat a guy with energy, direction, and commitment that brings the Musketeers together. I see companies struggling to decide if they are “managing safety” or “leading safety.” I have observed businesses outline goals to be a leader in safety for their corporation and/or industry, but believe they can accomplish this by micro-managing people, without leadership, education, or training. Businesses which are elementary in safety need to learn that the company cannot become a leader in safety when the management team seldom leaves the office, and/or does not discuss and set safety examples when visiting business operations. How do you see safety changing in the future or where is it headed? Since the global economic crisis, I have seen companies re-evaluating how safety and other departments are managed, to reduce costs and the number of personnel needed to complete the same tasks. The responsibility for providing a safe, productive, cost effective, quality service or product is being put more onto the manager/supervisor. I do not consider this a bad thing; safety should be a line management responsibility, but this is occurring with limited direction, training, and/or expectations provided to the manager/supervisor.